Wish your premises were smarter? With Steerpath you can find assets, people, spaces and routes to them either at an interactive kiosk, on a dashboard, on the web or in a mobile app. You can also find available spaces and assets and instantly use them. Are you ready to use incredible indoor maps and utilize your spaces and assets in a smarter, more efficient way? Steerpath has an industry standard REST API and Android, iOS and Web SDKs for easy integration with any platform. Whether you want to get or edit the points of interest or register for geo-fence triggers, we have the APIs for you. More information about the integration options can be be found at the For Developers section. Steerpath maps are beautiful and modern. They cover both indoor and outdoor areas. Users get the same navigating experience across channels (interactive kiosks, web, mobile). You can even have the maps customized to your organization graphical style and brand. 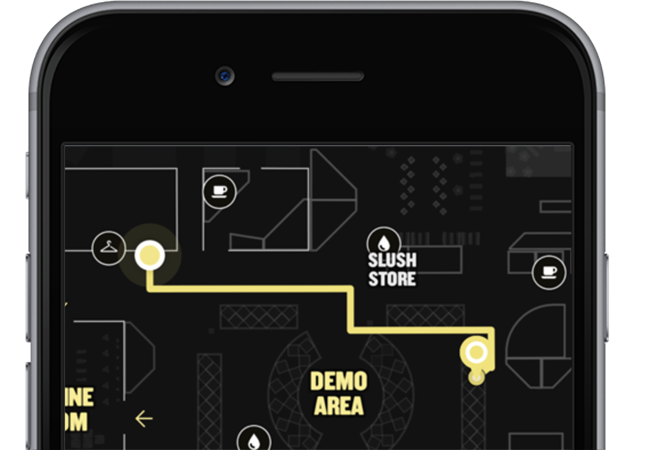 Steerpath Asset Tracking is a real-time location system that leverages the power of indoor positioning to deliver cost efficient tracking that works both indoors and outdoors. In the Steerpath Online Dashboard you can see the real-time locations of your assets. Everything in visible in one global view. We also provide you with a mobile application where your employees can view the asset locations. Steerpath Employee Tracking allows your employees to share their locations with each other in the similar manner as one can share an outdoor location in applications such as Facebook Messenger or WhatsApp. Then, finding the way to your colleagues whereabouts is easy with the turn-by-turn instructions of the Steerpath Indoor Navigation. Steerpath Employee Tracking can also be used for continuous tracking of employees locations to e.g. enhance work safety and operational efficiency. Steerpath Instant Booking can be used to allow people to quickly find nearest available meeting room. As soon as someone enters an empty meeting room it gets automatically booked for the next 15 minutes. This way, one can enter an available meeting room anytime e.g. to make a phone call and the room appears as booked in the organization’s booking system instantly. As soon as the person leaves the room the room becomes available in the organization’s booking system again. If a meeting room is available, the user can also book it for a longer time. Sometimes people book spaces but end up not using them and this means the space is in fact empty although the booking system shows it as booked. Steerpath Instant Booking makes the use of spaces more efficient as when there is no-one in the space it appears as free in the booking system. If your organization uses a business intelligence system such as Tableau or Microsoft Power BI, the analytics data that Steerpath collects can be imported to them. Steerpath offers an exceptionally easy process for installations large and small. 1) You to send us the floor plans of the building(s) in which you intend to use the Steerpath solution. The preferred file formats are AutoCAD files (.dwg or .dxf). If AutoCAD files are not available, you can provide the floor plans as some other vector file format (.svg, .pdf, etc.) instead. We digitize the floor plan and design the installation map for you.